Whenever I see promotional images for expensive BI Dashboard software, they always show the same thing – a map with countries or regions highlighted in different colors. It sends the subtle message that maps are the pinnacle of Business Intelligence (whether they are or not is a different matter altogether). Until Excel 2016, these Map Charts were not available natively in Excel. As a result, the BI Dashboard software stood out as being something which was more advanced, it had the “WOW” factor. 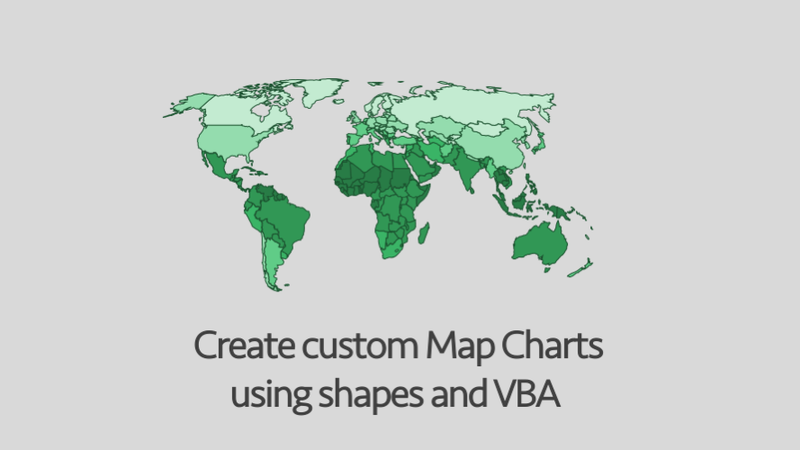 As you will see in this post, with a few images downloaded from the internet and some lines of VBA we can create our own custom Maps Charts in Excel. 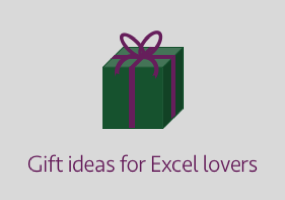 Our Excel dashboards can now have that “WOW” factor too. 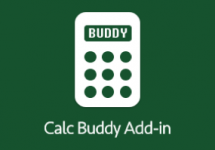 This solution should work in any version of Excel which can run Macros. Even if you have Excel 2016 with Maps Charts built in, you may still want to follow this article. The built-in Map Charts are amazing, but at the same time have various limitations, so this approach may better meet your requirements. In this post, you will find the World Map Template, which is available to download for free, but also instructions on how to create your own Map Charts. My goal for this post is to give you the tools, skills and knowledge to construct your own custom Map Charts. I want to share with you the World Map Template file. This template includes a world map, in which the countries change color when the values associated with those countries change. The functionality within this template can be applied to any map, or any shapes. Whether your map is of states, school districts or by geographical factors, this template can be adapted to any scenario. The World Map Template is available for newsletter subscribers to download for free. Please note, you do not need to download the file to create your own Map Chart, as all the instructions and VBA code are in the sections below. But it will be much easier to follow along if you have the World Map Template downloaded. I must say Thank You to www.freeworldmaps.com for allowing me to use and distribute their World Map images within the World Map Template. This is also a great site to get your hands on other maps. Try out the template for yourself. The countries in the map are formatted according to the names and values in Columns Q and R. The formatting applied is based on the fill color and left border color in Cells T2 – T8. Changing the values in Column Q, or changing the colored banding in Cells T2 – T8 will change the formatting of the countries on the map. The ColorToShape function (which I created using VBA) in Column S is the trigger which drives the functionality. For the functionality to work, the values in column Q must be identical to the names of the shapes on the map. If the ColorToShape function is applied to a name which is not also the name of a shape, there will be no effect. But, if the shape name exists, then its color and border will change. Clicking on one of the countries will reveal the name of the shape. As some countries, such as Indonesia are constructed of multiple shapes, each shape is named “Indonesia”. Each shape does not need to have a unique name. Naming the shapes in this way ensures the formatting is applied to all shapes associated with that country. This section covers the steps to create your own Map Chart, which will work in exactly the same way as the World Map Template. The specific VBA code for each step is provided. Get a map with each country/region as a separate shape. List the names of all the shapes. Rename all the shapes to usable names. Get a final list all the shapes (with usable names) and the value related to each country/region. 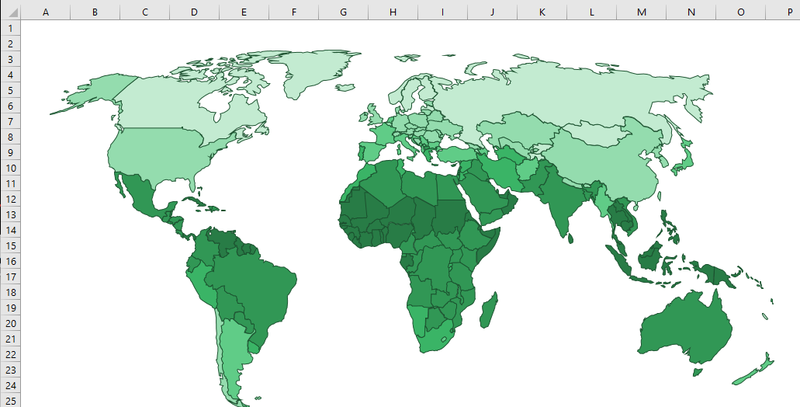 Define the colored banding for formatting each country/region. Use the ColorToShape User Defined Function to format the shapes. The easiest way to obtain new maps is to search the internet for maps embedded into PowerPoint files. You need to find maps where each country/region is a different shape. 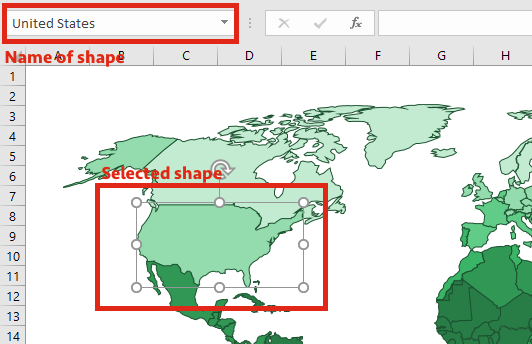 Simply copy the map (i.e all of the shapes) from PowerPoint into Excel. A good place to start is www.freeworldmaps.net, this is where I obtained the images for this post. You could draw the shapes yourself straight into Excel, it would be quite time-consuming, but an option all the same. To get a list of all the shape names, select a cell and run the ListAllCountries Macro. This Macro will list the names of all the shapes on the active worksheet, starting with the selected cell. On most maps you get from the internet the names of the shapes are not particularly helpful, for example, the shape may be called “Freeform 102”, rather than “Australia”. In these circumstances, it is necessary to rename the shapes to something usable. This can be most painful and time-consuming part of the process. The easiest way to rename a shape is to select the shape, change the name in the element name box then press Enter to confirm the change. However, using this method, it is not possible to give multiple shapes the same name, which is fine for some circumstances but not others (such as the Indonesia example stated above). By using the NameCountires User Defined Function it is possible to give multiple shapes the same name. The VBA code for the NameCountries function is here (Note – this code must be entered into a Module). Keep running the ListAllCountries Macro and the NameCountries function until you are happy with all the names. Next, give each shape a value based on the data you wish to represent, (e.g. temperature, income, life expectancy, school grades, or whatever else you want to use the map for). Next, create the ranges which will be applied to the countries. The fill color and left border color will be applied to each of the shapes. For the purposes of the ColorToShape User Defined Function (see below) it is necessary for the banding to go from smallest value at the top of the list to largest value at the bottom of the list. The map shapes do not have a ‘default color’, they will only change when the forced to by the ColorToShape function (see below). To ensure the formatting is correct, the values for each country must be between the lowest and highest value in the colored banding range. The Macros and User Defined Functions so far have been purely to set-up the map template in the right way. It is the ColorToShape function which drives the working template. countryName = the name of the shape, can be a string or a single cell reference to a string. lookupValue = the value associated with the country/region/shape, can be a value or a single cell reference to a value. lookupRange = the range of cells containing the values and colored banding to be applied to the countries/regions/shapes. When this function is recalculated, it will change the color of the shapes based on the lookupValue and lookupRange. 'Set default value of the function to "Not Found"
'Change the result of the UDF to "Formatted"
The ColorToShape function calls another function to obtain the correct RGB color reference. Include the following code within the same Module as the ColorToShape function. Hopefully you can see the subtle message that Excel is not a good Business Intelligence tool is flawed. A bit of Excel/VBA trickery is all that is required to turn Excel into a tool which can create Map Charts. The expensive BI tools will be much easier to set-up, but will be limited in their options. Using this method, Excel can be turned into anything you wish, for example, if you want a map of Middle Earth from the Lord of the Rings, it can be achieved with Excel. Thanks for the write-up. It ill cut down that learning curve considerably! Hi Mitch – I hadn’t thought of games as a possible usage, that’s a good idea. Hi, please verify link of download of world map, not working for me. Hi Flavio – I’ve just tried it and it’s working for me. But I will e-mail you a copy directly. I tried to add some more color band cells but they do not seem to work. I added a few more below the 30 value cell and added the values of 35. 40, 45 etc. 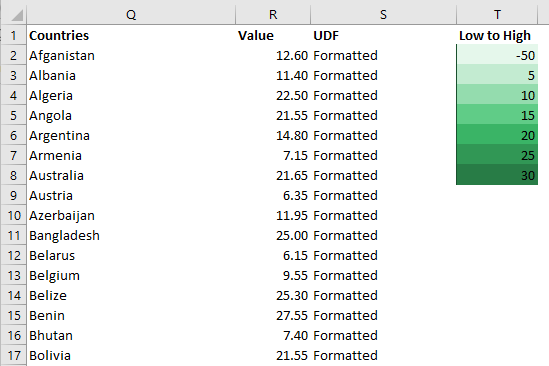 Changing the value of a country to a new value above 30 shows up the UDF column as “Not Found”. How do I add more value color cells? (1) Insert new color cells into the existing color cells (i.e. don’t add to the bottom, but add into the middle). This will expand the formula range automatically. (2) Add the color cells to the bottom as you have already. The formula in Column S refers to the range $T$2:$T:$10, expand this range to incorporate the new cells added to the bottom. I want to create my own map, with countries I’ll draw. Is it correct the images should be vector files? The pictures must be editable as shapes, so they will need to be vector images which Excel will render. I’m not sure which vector images are compatible with Excel, so it would be worth testing one shape first just to make sure. There are a number of sites which provide maps for free or at a small price. It might be worth looking into those to save some time.